We are rounding out Women's History Month with a woman who made history as a leader on the world stage. Sticking it out in the bristly world of politics, Ngozi Okonjo-Iweala has proved that she is truly worth her weight in gold. Her accomplishments have made a wonderful impact on Nigeria and her leadership has served as a bright light to women the world over. 56 years young, Ngozi Okonjo-Iweala was born in 1954 to the Umu Obi Obahai Royal Family of Ogwashi-Uku in Nigeria. Focused on her education, she graduated from Harvard University in 1977, then went on to earn her Doctorate's degree from MIT in regional economic development. Prepped to tackle the economy on a global scale, Okonjo-Iweala served as Vice President and Corporate Secretary of the World Bank Group. 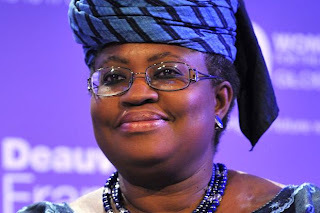 "When I became finance minister they called me Okonjo-Wahala – or Trouble Woman," says Okonjo-Iweala. In 2003 she began her political career as the Finance Minister of Nigeria in President Obasanjo's cabinet. Okonjo-Iweala was the first woman to hold both the Finance Minister position and then Foreign Minister position in Nigeria. Met with a score of challenges and debt, she played a key role in Nigeria's reciept of its first sovereign credit rating as well as introducing transparency of the country's economics. After her resignation in 2006, Okonjo-Iweala was appointed Managing Director at the World Bank by then Presiden Robert Zoellick. She left her position at the World Bank in 2011, to once again make great strides as the Finance Minister of Nigeria. 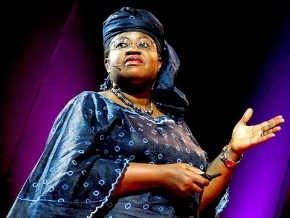 Ngozi Okonjo-Iweala has been threatened, her mother has been held for ransom, and she still fights. She fights to end a system of corruption in Nigeria and for an economic stability that will serve as an example for other nations. Ngozi Okonjo-Iweala has great aspirations and a clear vision for the future. Today we salute a woman who is not only cleaning up Nigeria's finances, but leading the continent.